Kevin Dietsch-Pool/Getty ImagesPresident Donald Trump does not want to reduce arms sales to Saudi Arabia as a response to Jamal Khashoggi’s killing. President Donald Trump on Tuesday signalled to the world he feels the US-Saudi relationship is so utterly indispensable that he’s willing to give Riyadh a pass on the brutal killing of Jamal Khashoggi. 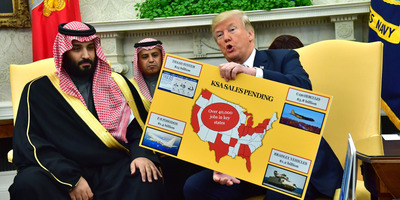 Trump touted Saudi Arabia’s efforts to thwart Iran, as well as US arms sales and low oil prices in his controversial, forceful defence of the kingdom. Foreign policy and national security experts feel Trump has greatly embellished the extent to which the US needs Saudi Arabia as a partner. At the end of the day, Saudi Arabia now needs the US more than it needs the kingdom, but Trump’s policy in the region does not reflect this reality whatsoever. The foreign policy community in the US was floored by the statement Trump released to this effect, characterising it as antithetical to America’s values and interests. Foreign policy and national security experts also feel Trump has greatly embellished the extent to which the US needs Saudi Arabia as a partner. The president in his statement also touted the purported economic benefits of the US partnership with Saudi Arabia, making inaccurate claims about US arms sales while emphasising low oil prices. Miller, who’s now the vice president and Middle East program director at the Wilson Center, said Saudi Arabia and Prince Mohammed have succeeded in “bamboozling” the president. “We are being played,” he said. Saudi Arabia is an “important security partner,” Miller said, but not a true American ally as Trump said given it doesn’t share US values. With that said, the strategic partnership between the US and Saudis that dates back to the 1940s has begun to crumble in recent years. For decades, the US has provided security, while the Saudis have provided oil. But the US no longer needs Saudi oil, Miller said, as the shale revolution has made it virtually energy independent. Indeed, it’s the US, not Saudi Arabia, that is now the world’s largest crude-oil producer. At the end of the day, Saudi Arabia now needs the US “a lot more than we need them,” Gen. Wesley Clark, the former NATO Supreme Allied Commander, told CNN on Tuesday in response to the president’s statement. Clark said that the Saudis “need” US protection but the US no longer needs their oil, adding that though it might be “inconvenient” in the short-run for the US government to take actions that hurt the royal family there’s also important strategic value in upholding American ideals.
.@JohnBerman: "Are human rights necessarily in opposition to American rights?" Miller said Trump’s obstinate support for Saudi Arabia is linked to his desire to be fundamentally anti-Obama. The president felt his predecessor undermined two historically key partnerships with his policy toward Saudi Arabia and Israel and has been “determined to show that these are our core partners in the region and we are going to build policy around them,” Miller said. 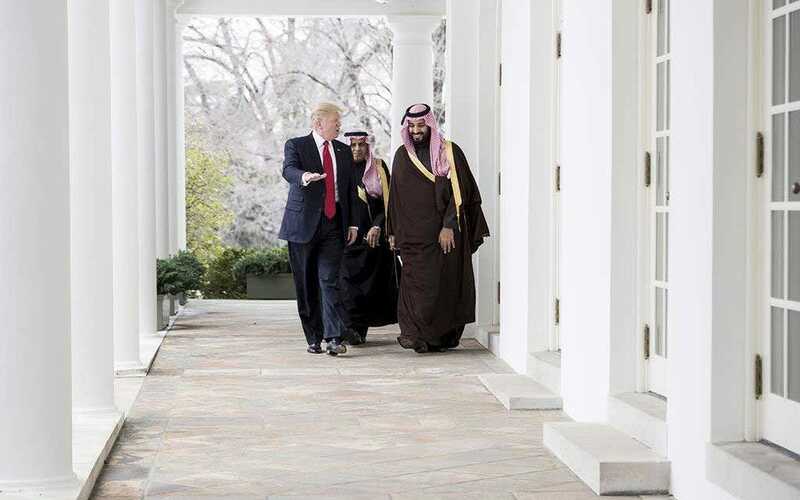 “I’ve had meetings with Jared Kushner and they are clearly relying on the Saudis for their regional strategy,” he added. It’s no coincidence that Trump’s first trip abroad involved visits to Riyadh and Jerusalem. In the past, presidents often travelled closer to home, visiting neighbouring countries like Canada and Mexico, on their initial foreign trips. Miller said what’s required moving forward is more balance in terms of US policy in the Middle East, contending the Trump administration needs to take advantage of the leverage it has over the Saudis in the region. This would involve cooperating with Iran when it serves US interests, but standing against it when it doesn’t. “We’ve allowed the US-Saudi relationship to get out of control… and Khashoggi’s murder is just the most extreme manifestation of a relationship that’s out of control,” Miller said. 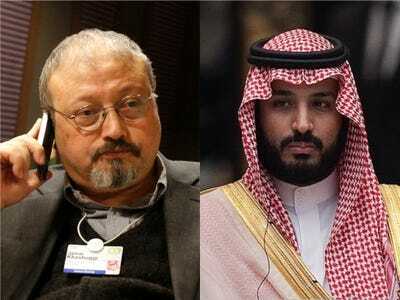 Khashoggi, a journalist and US resident who wrote for The Washington Post, was killed in the Saudi consulate in Istanbul on October 2. The Saudi leadership’s narrative on Khashoggi’s disturbing killing has taken numerous twists and turns, shifting from outright denial to acknowledging that members of the government ended his life. The CIA has reportedly concluded with “high confidence” that Khashoggi’s killing was ordered by Crown Prince Mohammed bin Salman, the de facto ruler of the country. Trump in his statement on Tuesday said “maybe” Prince Mohammed orchestrated the killing, but “maybe he didn’t.” He’s subsequently been accused of once again undermining the US intelligence community.